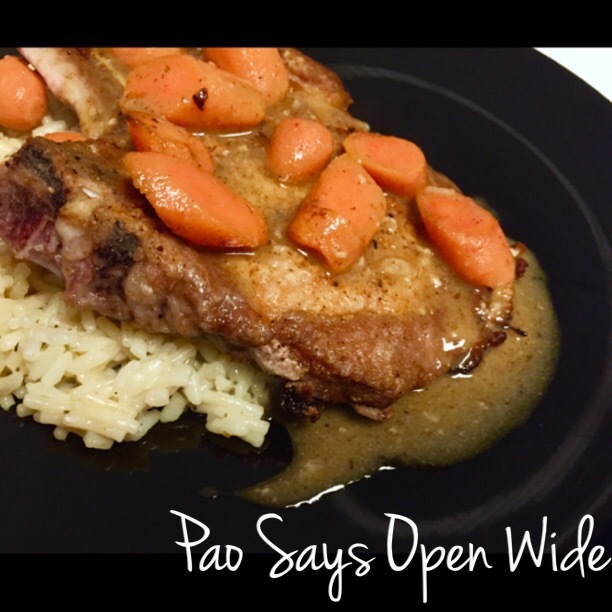 This Little Piggy Went… In My Belly: Honey-Dijon Pork Chops with Carrots and Herbed Rice – Pao Says, "Open Wide!" Combine the flour, salt, cayenne pepper, smoked paprika, and garlic powder in a shallow bowl. Coat the pork chops in the flour mixture- make sure the pork chops are at room temperature, otherwise they won’t cook evenly! Coat the bottom of a pan with olive oil and set it over med-hi heat. Cook the pork chops in the oil; for a 1/2 inch thick chop, I have it about 3 minutes per side. Once the chops are cooked, set them aside. In the same pan, toss in the chopped carrots and the splash of white wine. Cover the pan for about 2 minutes while the carrots cook a bit. Add the dijon, the honey, and the chicken stock, and mix all the components together into a nice, uniform sauce. Plate your pork chops and pour the carrots and sauce over the top of them! Enjoy!